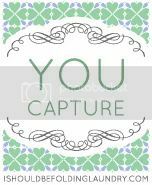 You capture is being hosted at Kidnapped by Suburbia this week because Beth at I should be folding laundry had her baby! This week we were supposed to capture feet. I'll admit I forgot all about it until this morning. So, here are my five favorite little feet. Not the best picture . . . but it's all I have. I do that with my kids, too.